All nature lovers that know Africa will tell you: nothing beats an African safari to discover the “big game” that has excited us since our childhood. To fill closer to wildlife, to believe we are adventurers - just for one day, this is what the most sincere of us can pretend to. Leave to the tourists a more “consumer” approach to the African wilderness and their exclamation after three days of game sight-seeing and accommodation in a luxury lodges: ”Yes, I know Africa, I have been there…I’ve done that”. Africa captures your “heart”. So far, nothing new: many others have said and probably have felt it before I did. So much the better, or perhaps not, considering what this land has become: you can still feel its power, despite the fury that takes men of all colours to enslave to its depths to extract gold, uranium, diamonds, or oil, or to build large greenhouses where to grow green beans recommended in each Western diet and cut flowers that will die in a vase on a table somewhere. Men are so ungrateful of this surrounding beauty: like everywhere on the planet, they assume the right to dispose of everything, regardless the consequences that will inevitably occur. The world will be less beautiful when there will be no more trees, or fish or birds, or the big cats. This “earthy” something, with no frills, is a kind of timeless primary energy that overwhelms us when we agree to open up to what is surrounding us. And it is especially true in the Kenyan savannah. I yielded willingly to the magic of the Maasaï Mara. And that is why I want to sound the alarm for it. By discovering this region in which the delicate balance is threatened, I tried to understand what might be done to preserve this land. The only threat is from man. The only solution will be led by man. After a few hours’ drive from Nairobi (300 km of sometimes “unusual” roads) you arrive in the famous Maasaï Mara at an altitude of 1500m, passing one of the six gates: the Oloololo Gate on the north and the Musiara Gate on the north-east, the Talek Gate and the Sekenani Gate at the east, the Ololaimutia Gate and the Sand River Gate in the south. 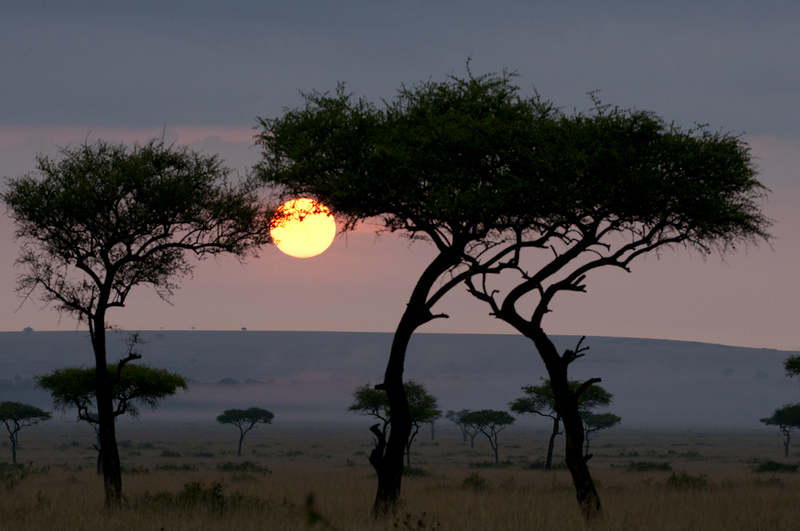 Since 1974, there are some 1510km² in the South-Western Kenya that extend naturally to the South, towards the Serengeti in Tanzania, that have the national reserve status. 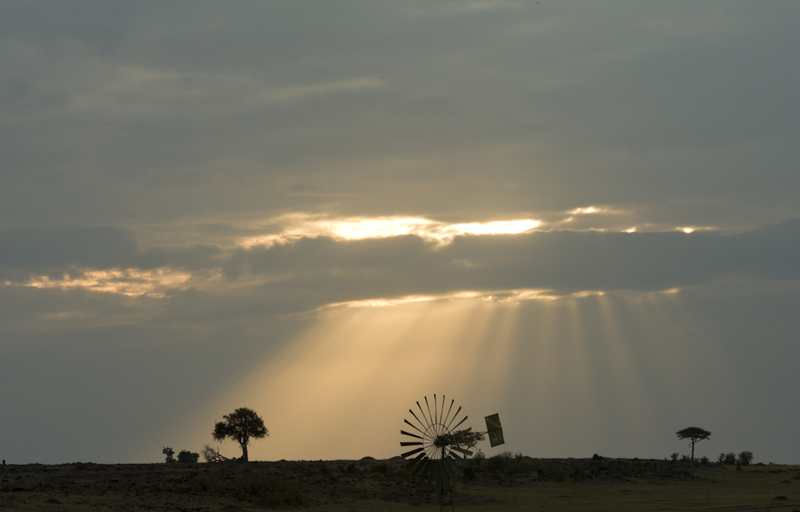 The reserve is named after the Mara River that crosses its territory from North to South, while the Talek and Sand rivers run through it from West to East. The National Reserve status of allows the Maasai people to continue to live on ancestral land and to graze their herds, unlike the National Parks, which are void of human activities other than tourism and scientific study. These activities are managed by the Kenya governmental agency KWS (Kenyan Wildlife Service) that is responsible for wildlife in the country on three main areas including: research, injured animals, and animal census. Some famous Kenyan parks managed by KWS are Meru NP, Tsavo NP, Samburu NP, Nakuru NP. 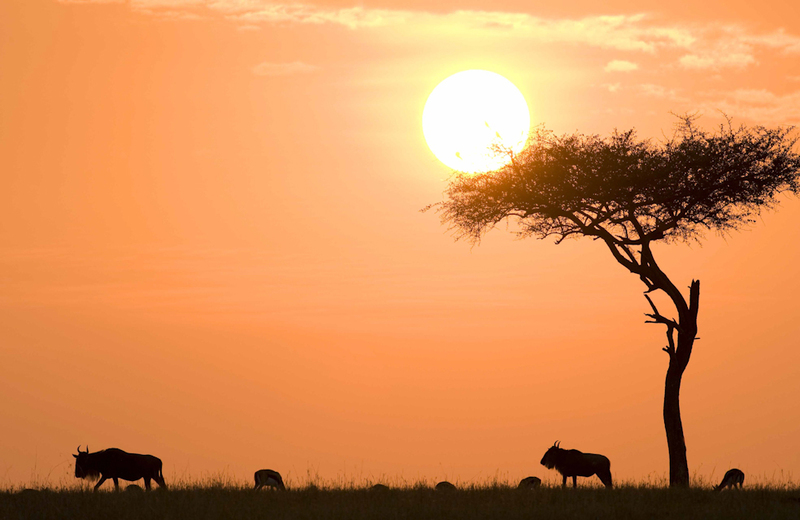 Revenues generated from tourism in the Maasai Mara are significant. But who benefits this tourism windfall and is it sustainable? The Maasai Mara became a world famous destination for nature lovers because of the richness of its fauna, with, among other species, the famous “big five” (elephant, black rhino, buffalo, lion and leopard). Touristic development had begun. Today there are about 3000 tourist beds in the Maasai Mara reserve side, on an area of approximately 1000km², divided into an ever increasing number of lodges and camps. 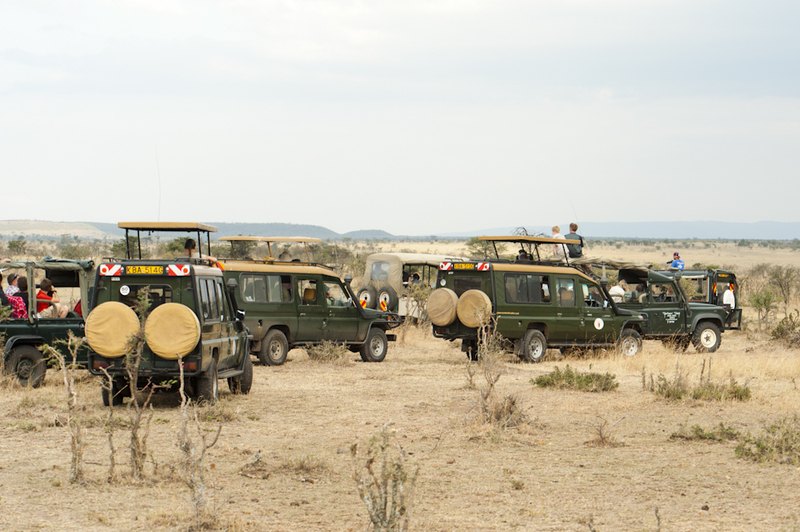 During the tourist season, from June to September/October, and even out of the season now, traditional land-rovers are supplanted by more and more numerous cars and even white minibus, that drive the tourists willing to take as many pictures as possible in a few hours’ game drive. On the other side, that of the Mara Conservancy that manages the “Mara Triangle” that goes along the Oloololo escarpment till the Ollololo Gate, and then goes down to the Mara river till the Tanzanian border, there are to now some 400 beds for a 500km² territory. But beyond these figures, it is mainly a question of two different approaches to nature and to tourist management. The Narok County Council earns around $20 million through tourism. But who benefits from this money? Few funds seem attributable to the trail maintenance of the reserve and to the work of rangers, nothing or little for animals themselves, and probably little to Maasai families living there. No real figures are available. Regarding the Mara Conservancy, the County Council of Trans-Mara mandates the Mara Conservancy to undertake all aspects of protected area management including: revenue collection and distribution, security, tourism development and management, infrastructure maintenance and development (all new projects require an Environmental Impact Assessment (EIA) and approval by a joint committee comprising members of the Conservancy and County Council). Revenues are more modest but the figures are clear: about $3.5M to $4M per year, that are managed by Bryan Heat, who has been the director for past ten years. About 65% of this amount goes to the County Council of Trans-Mara and the local population, while 36% of the budget, i.e. between $1.2M and $1.5 M (2011) are allocated to management of the reserve: salaries and training of rangers, anti-poaching measures with trained dogs and excellent knowledge of the animals of the reserve, monitoring and security of tourists. As always, there are multiple causes for the disappearance of fauna, and as it is almost always the case, it is linked to human activity. The sequence of a certain number of events and their consequences, and the combination of these factors destroy the natural balance and contribute to the disappearance of the flora and fauna. Considering the ecosystem from the perspective of the food chain, you only need to look at the plants and trees. 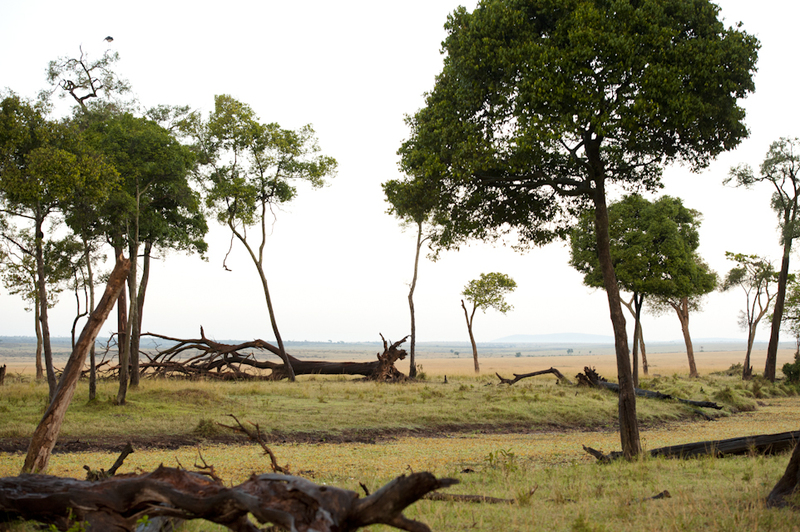 Old trees are obviously disappearing in the Maasai Mara. As they fall down, there are no young trees growing up to replace them. Some attribute their disappearance to the elephants. However, remember that in a not so distant past, elephants were able to move freely accross the country, leaving the vegetation enough time to grow back. But today there are no corridors for them and therefore they are forced to remain on a territory that is reducing in size as quickly as the cities are expanding. Vegetation cannot grow back after their passage and elephants no longer have anywhere to go ... On the issue of regeneration of trees, some studies are conducted in recent years by the Mara Conservancy. Nets and cages against insects and herbivores have protected some young trees. No tangible explanation has yet been published. As for the Maasai Mara, near Musiara in particular, it is likely that the problem is directly related to the level of the water table: increasingly numerous lodges pumping water from the Mara to the tourists’ convenience, but also, all the year round, the corn farms upstream of the Mara river which are also responsible for the decline of the river level. Once more, it is not with no impact on the environment. A study was also undertaken on the invasive plant Parthenium hysterophorus  that develops at high speed into the Maasai Mara. The implications for the Maasai Mara wildlife are potentially serious. 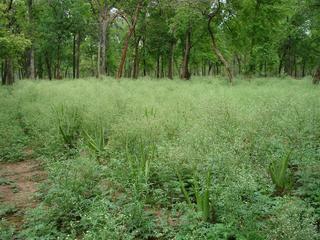 Thousands of animals searching for grazing, means that the grasslands are highly disturbed, making it easier for Parthenium to invade. “Unless action is taken immediately to eradicate known infestations in the Maasai Mara it is not unrealistic to expect a drastic reduction in wildlife population in the long term as the Parthenium population rapidly expands as an invading species,” says Geoffrey Howard, the IUCN’s global invasive species programme coordinator. 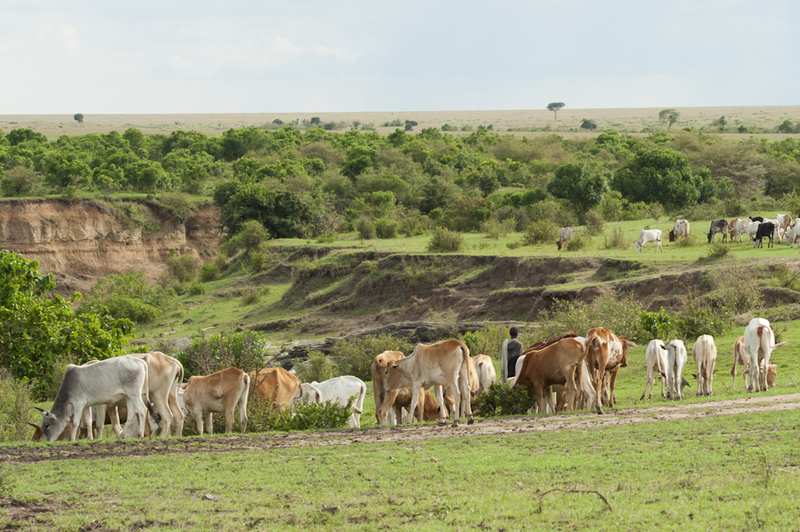 Pollution associated with pesticide use on large farms around Kenya’s Maasai Mara Reserve is probably responsible for the disappearance of part of the flora, but also the disappearance of insects, the next link of the trophic chain. Consequently, some flocks of common birds have disappeared, as other insectivorous animals have, and the whole balance of the ecosystem is threatened. Some people have reported a kind of skin discoloration among hippos in rivers where the current is low: would there be a greater concentration of toxics in these stagnant waters? It would be interesting to study it. Disease has not spared the Maasai Mara. In 2008, the wildebeests were victims of dengue, carried by mosquitoes. The dengue fever generates serious skin problems in animals. Some cheetahs, whose population is critically endangered, have eaten weakened wildebeests, and consequently, died by the dengue transmission. The resident wildebeests are a key-element of the Maasai Mara ecosystem. In 2009 KWS began a census. The KWS does not publish its figures, but since 2008 some articles have already mentioned the wildlife population decline in the Maasai Mara. This could make you smile, but the herds are a real problem in the Maasai Mara. The Maasai raise cattle neither for meat nor for milk, but because to have many cows is a sign of wealth. This tradition continues today: Olé Timama, the Maasaï great current leader himself has more than 9,000 heads of cattle while living in Nairobi. Thus, the richer the Maasaï become, the more the cattle is increasing. Previously, the herds were not allowed to enter on the reserve territory. But in 2009, a severe drought has killed up to 60-70% of the livestock. As a result of this drought the Narok County Council has now authorised the entry of cattle into the reserve, first around the Talek River and at Musiara. Since then, this concession has become law and herds now invade the landscape. At night the lights of cowherders multiply like wisps browsing the savannah, and during the day, the children who lead their herds out of bomas (enclosure surrounding the Maasai villages) are no longer hiding from the tourists. Why these cows are they a problem for wildlife? Cows are selective: they know what to choose to feed and they leave the non-edible grasses. Consequently there is less food for wild herbivores, whose populations are declining. It has been shown that when the territories of food must be shared, a stress is generated in wild animals. This stress can lead to self-limiting births among the wild animals, who are an important link in the food chain of the Maasai Mara. In addition, trampling by cattle changes the structure of the soil and prevents regrowth of certain plants; areas of pasture are quite visible from planes. However, there is a secondary benefit for wild herbivores by living among the cattle: protection against predators such as lions or leopards. The presence of the cowherders keeps them away from a potential prey. Historically and culturally, the Maasai and the lions have cohabitated together. To be “politically correct”, the Narok County Council has hired rangers to monitor the reserve. But, often, rangers are themselves Maasai cows’ owners. If rangers are monitoring lodges cars to prevent them from going off-track, they do not intervene on the herds or on their owners. Between family ties and economic links between rangers and owners, the herds have not finished blooming on the Maasai Mara Reserve. However, the Mara Conservancy has taken strong measures: the cattle are not allowed. If the rangers arrest a cowherder, they transfer him to the police. If a grazing herd is caught on the reserve territory and its cowherder has “disappeared”, the most beautiful cows are then slaughtered by the rangers and served for diner to the reserve staff. Some episodes were enough for cattle owners to respect the ban. The figures reported are those of the Mara Conservancy that cooperates with the Serengeti Park in Tanzania to fight against poaching. Thus in 2010, on the 1540 poachers that were arrested by the Mara Conservancy, 95% came from Tanzania. Some poachers were arrested several times, one of them up to 5 times in the year! And figures concern only those who were arrested... They are then presented to a judge and sentenced to a 2 to 4-week imprisonment, before being released ... and again. They mainly poach with snares, cost of which is 50 schillings unity (0.50 € or 5 matchboxes at local price...). The snares do not make any distinction: victims are herbivores such as zebras, topis, and wildebeests. 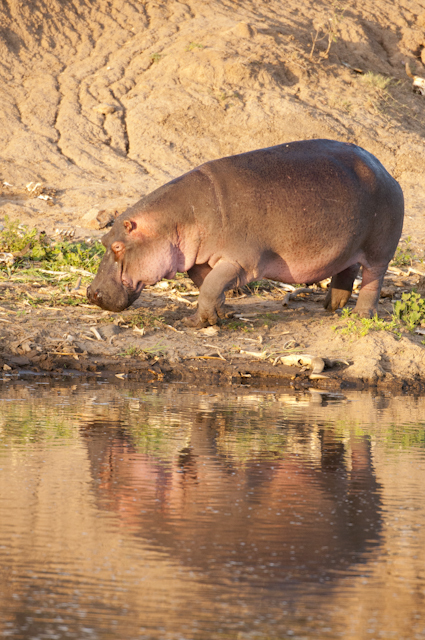 During the wildebeest’ migration, from July to October, some hippos and warthogs are trapped too. Some Thomson’s gazelles are hunted at night with torches and dogs. The big cats are also taken by snares. 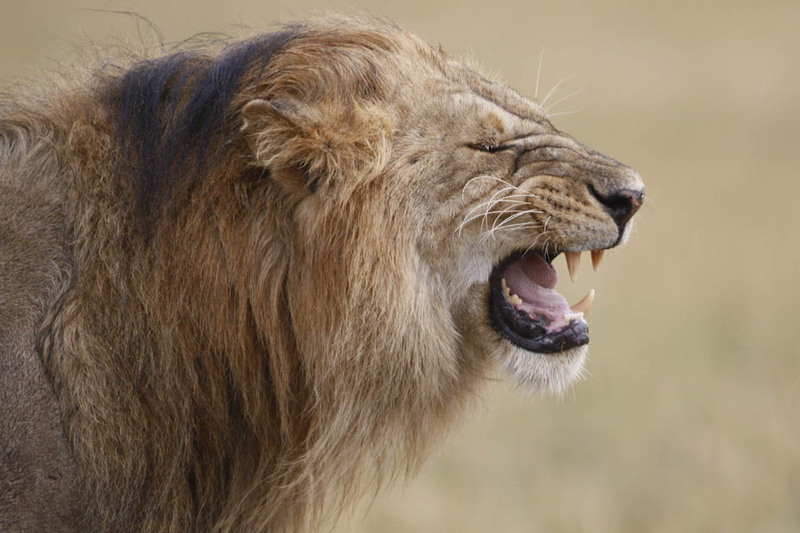 In 2010 a lion died trapped by a snare, a leopard and a cheetah were also found dead, but there are probably more snared cats that are just not found. Elephants can also be victims of snares that shear their trunk, making it impossible for them to eat, without mentioning the suffering because of mutilation, gangrene. The figures for poaching provided by the Mara Conservancy can be extrapolated to the Maasai Mara reserve with an area two times larger and more importantly much less supervised. Nothing visible is undertaken in fighting against poaching and no figures are available. The safari tourism represents a very large source of revenue for the country, and finds itself at the centre of policy issues that go far beyond what one can imagine. Some Kenyans have tried to change things but they sometimes paid with their lives. A few years ago, one of the former directors of the KWS was paralyzed in both legs and an arm after his plane was sabotaged, soon after having talked about reforms; the saboteurs were never arrested. As the director of KWS, he has hindered the established ivory traffic at the time: the biggest sponsor was very close to the first government of Kenya. But we must also remember that in 1989, Daniel Arap Moi, Kenya’s second president, had burned 12 tons of elephant tusks to mark the will of Kenya to end the poaching for ivory. The following year, a total ban on international ivory trade took effect. Unfortunately, according to the KWS, the country lost 278 elephants in 2011, against 177 in 2010. Indeed, elephant poaching is experiencing a marked increase in Kenya and in other countries range in Africa. 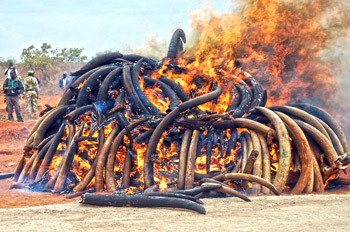 Kenya was still burning five tons of ivory July 20, 2011 ... in spite of the legal market for ivory opening again. In April 2012 the Kenyan government launched a strategy for managing elephants and reaffirmed the country’s commitment to protect its elephants in the long run. How to preserve this precious wildlife? 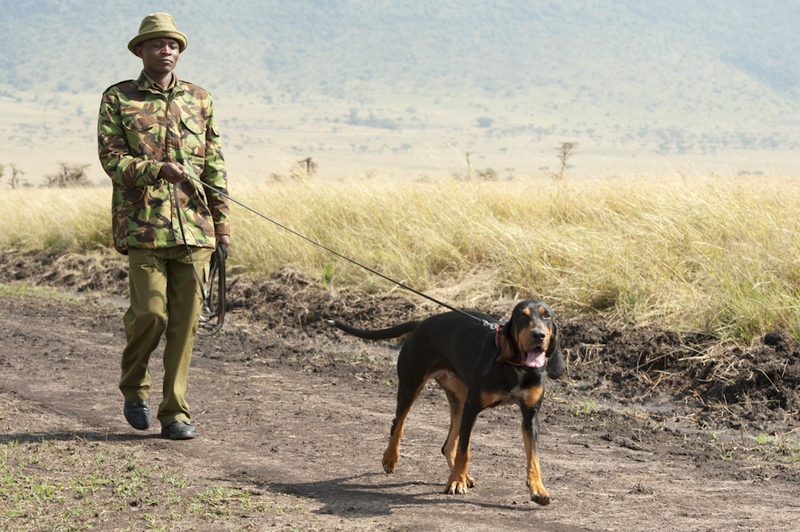 The KWS has been co-operating for several years with IFAW (International Fund for Animal Welfare) and other international institutions and NGOs to enforce Kenyan law on fight against poaching and to tune the conflicts between humans and animals. 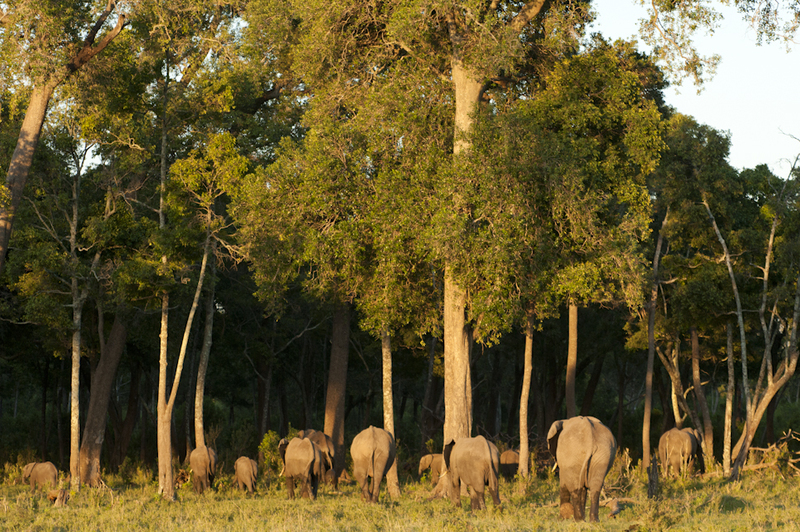 Promote research and rely on advanced monitoring systems to improve the management of elephants. This strategy involves a significant fieldwork, resources and cooperation of local communities in order to complete it. But these are national parks managed by KWS. How can we preserve the Maasai Mara? What seems the most accessible is at first educating the tourists. Develop their environmental awareness: Some tourists litter the park with their cigarette butts, their plastic bottles, toilet paper, despite the recommendations of their drivers. Do not hesitate to correct these “poorly educated”! 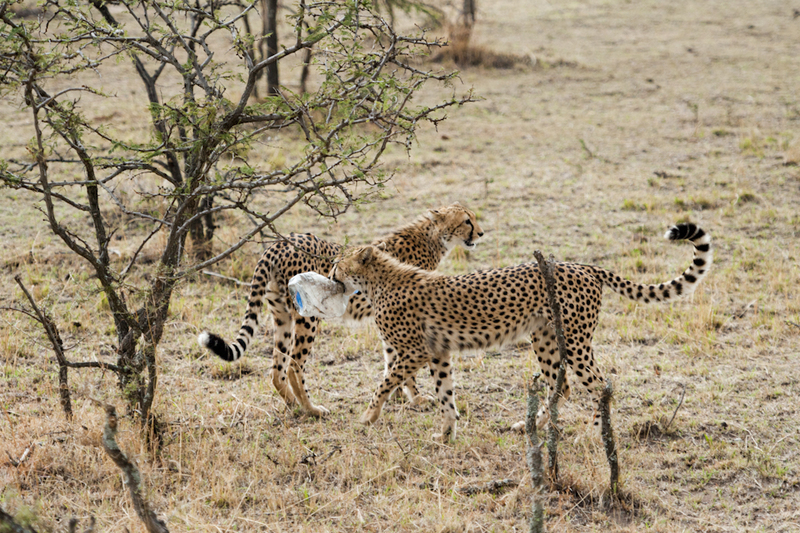 Collect, while you are here, waste dotting the savannah, without taking the risk to remove a plastic bottle from the jaws of a cheetah of course! Finally, the only remaining hope is awareness of local, regional, governmental, and - why not? - international authorities, to allow a long-term political vision that prohibits new constructions in the Maasai Mara and limits their environmental impact and on the surrounding lands. If the wildlife disappears, tourism revenues are going to disappear: a real economic problem for the Kenya. We would prefer to ask the question in the exactly opposite way: besides the loss of revenue from safaris, can we take the risk of loss of wildlife and flora of the Maasai Mara savannah? The Parthenium hysterophorus, a poisonous plant native to the American tropics, invades empty lots, the roadsides, the riversides, preferring abandoned areas. This is an invasive species that rapidly colonizes any space, at the expense of long established desirable vegetation. Before long, it can reduce a pasture to almost nothing, leaving no vegetation to the herds. It threatens the crops. 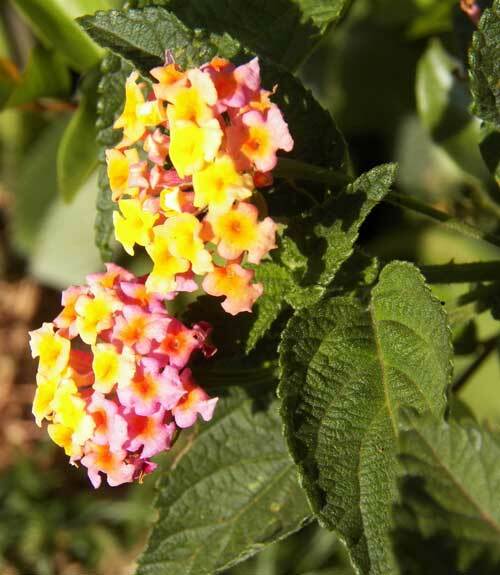 In humans, its pollen is causing breathing problems, allergies, sinusitis, asthma, skin diseases and eye problems. In animals, it reduces milk production and makes them lose weight. 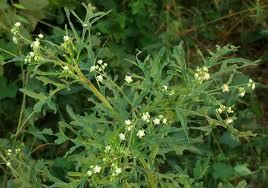 The Parthenium has been found in parts of the Mara River, and along some trails that crisscross the park. Carried by the wind, vehicles, movement of machinery, or water, the species could extend them without restraint. The ecological conditions are favourable. And loss of pastures grazed by animals, could pave the way.